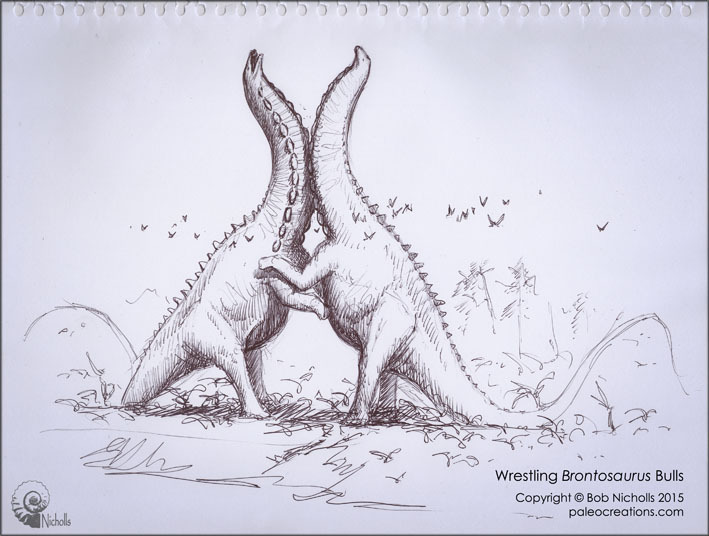 Here’s the last post (at least for now) in the Fighting Apatosaur Art series — and we’re back to Brian Engh, who we started with. As a piece of art, I really like this one: the boldness, the vivid contrasts, the alien quality of the animals. But as a palaeobiological hypothesis, it doesn’t really work: so much of the neck morphology in apatosaurs is to do with absorbing ventral forces that soft-tissue display structures down there don’t make a whole lot of sense. 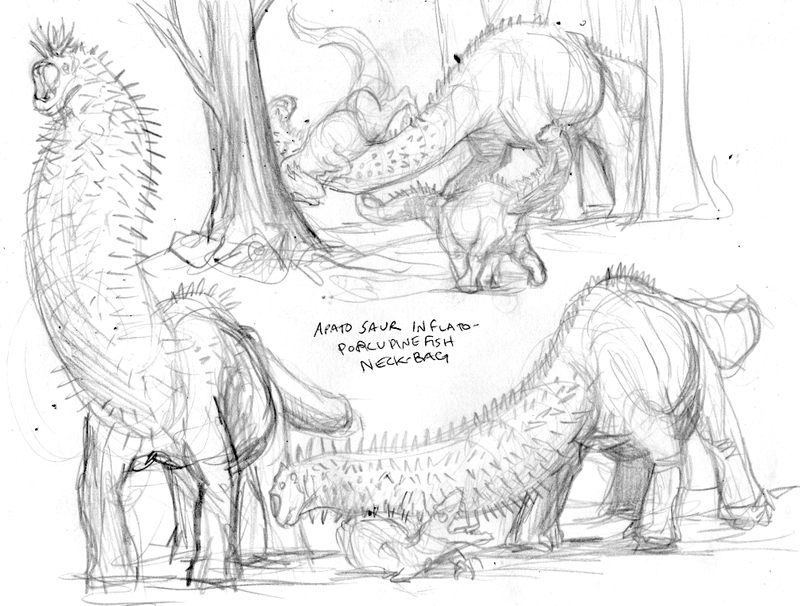 Here’s the other one — which Brian titles “Apatosaur inflato-porcupine fish neck-bag”. 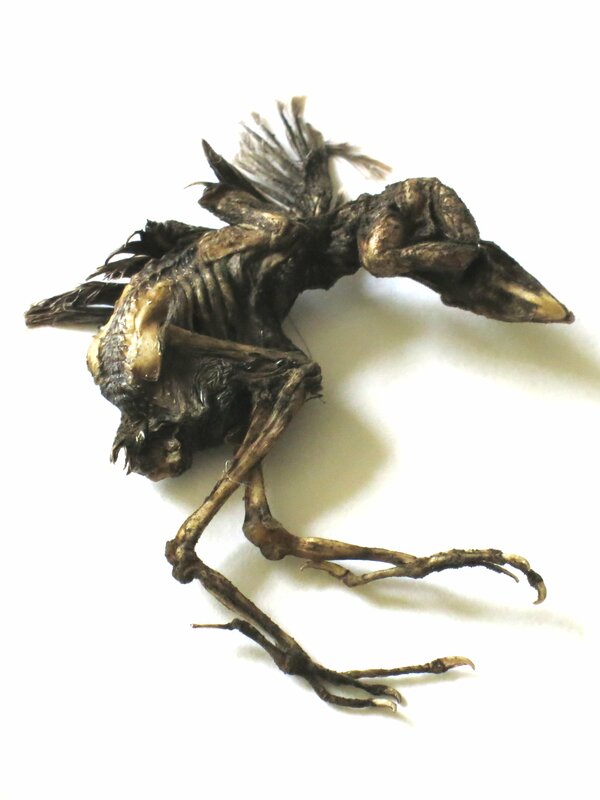 I particularly like the way the theropod being rolled around on the ground and repeatedly spiked. It’s no more than it deserves. Does the idea of an inflatable neck make sense? I wouldn’t be at all surprised if there were sauropods that did something like this — plenty of extant animals inflate parts of their body for display purposes, after all — but I don’t think it would have been apatosaurs. Again, the characteristic features of the neck don’t seem well matched to this scenario. 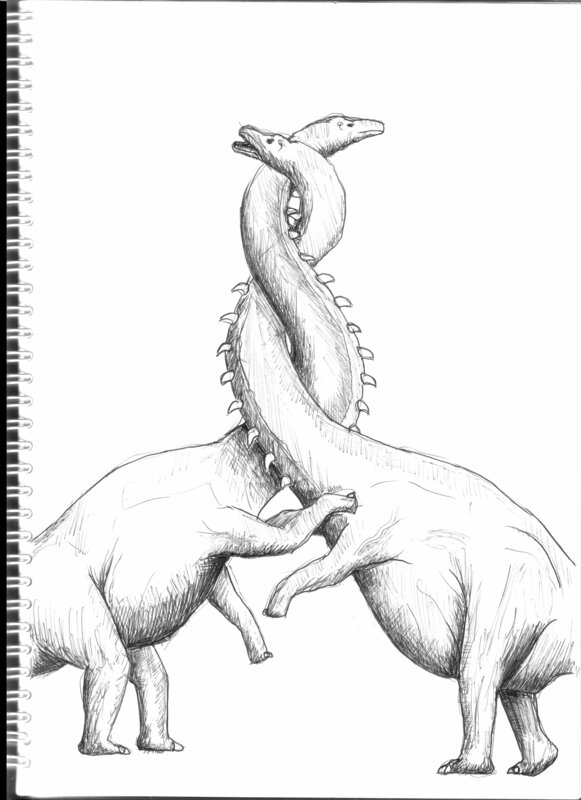 Well, that’s all the apatosaur neck-combat art we have. If there’s to be a part 7 in this series, it will be made of artwork that you, dear readers, have contributed. Fire away! If we accept that the distinctive ventral projections of the gigantic and ventrally displaced cervical ribs of apatosaurs were likely the base of some form of soft-tissue rugosity — such as keratinous horns like those of rhinos — then does it follow that those necks were used in combat as we suggested? Maybe, maybe not. As scientists, we are always open to other hypotheses. We’re looking for the simplest, most parsimonious model — the one which best explains the facts. 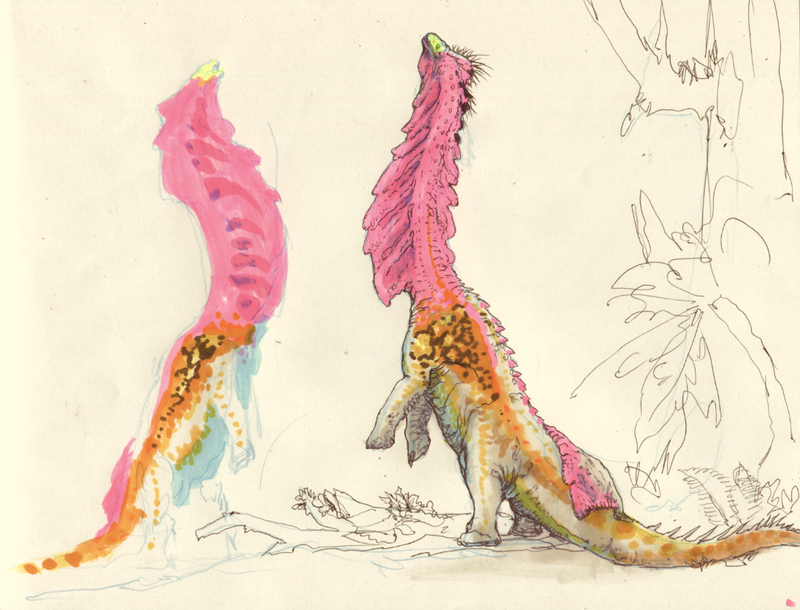 That’s why we like Mark Witton’s “neck-velcro wall-climbing” hypothesis, as shown in this actual scientific life restoration. As Mark explained to me, apatosaurs may have used their neck-hooks for more than passive clinging. 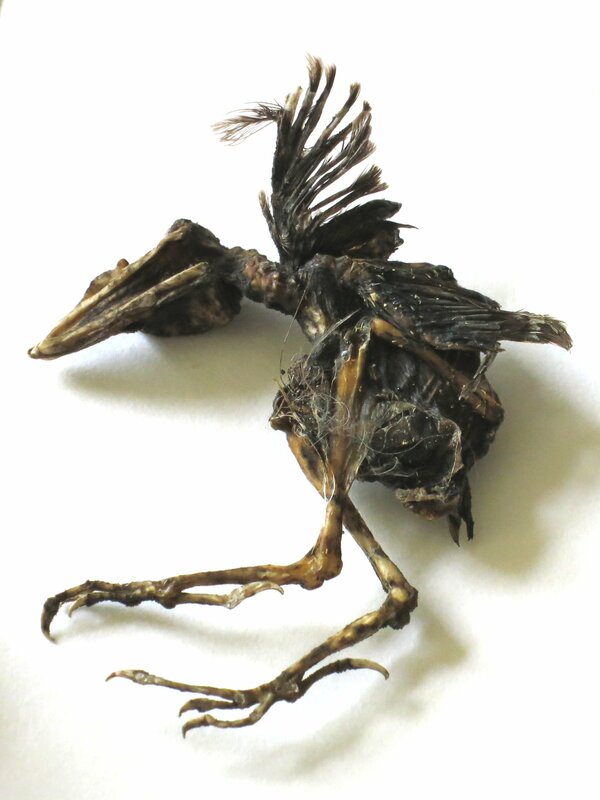 They may also have been used for inching up the rock-face: first one side of the neck advancing and then the next, in the manner of the “pterygoid walking” that snakes use to progressively swallow large prey. This is why it’s important to present early-stage work at conferences (and as preprints). Otherwise, you may never hear about important alternative hypotheses like this until after the paper is out and it’s too late to include them. 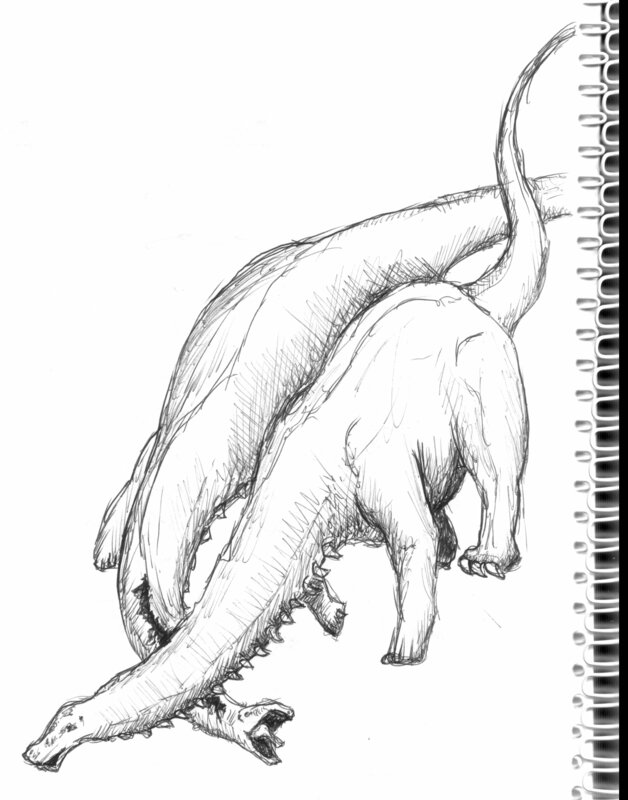 I mentioned last time that, as I sat next to Bob Nicholls in an SVPCA session, I started sketching an apatosaur combat in the hope that my horrible drawing would provoke Bob to do a good one. That worked admirably, which means there is no good reason for me to subject you to my own sketch. I may be just about capable of drawing tails. During a break, I asked for Bob’s advice on how I can do better. I know I’ll never be an artist, but it’s fun to sketch (especially during mammal talks) and I’d like to improve a little. The main point Bob made was to think about where the light is coming from. Be consistent about that, and you get an immediate improvement in realism. I didn’t consciously do this, but I ended up with a composition kind of similar to what Bob came up with, but worse. In my desire to achieve the intertwined-necks pose, I made the necks too long and thin. I still can’t draw heads. Let’s just forget about the hindlimb of the one on the left. Uh, and let’s forget the torsos, too. But at least the light is coming from top right! In short, as Stephen Sondheim put it, art isn’t easy. I wish I had more time to put into it. 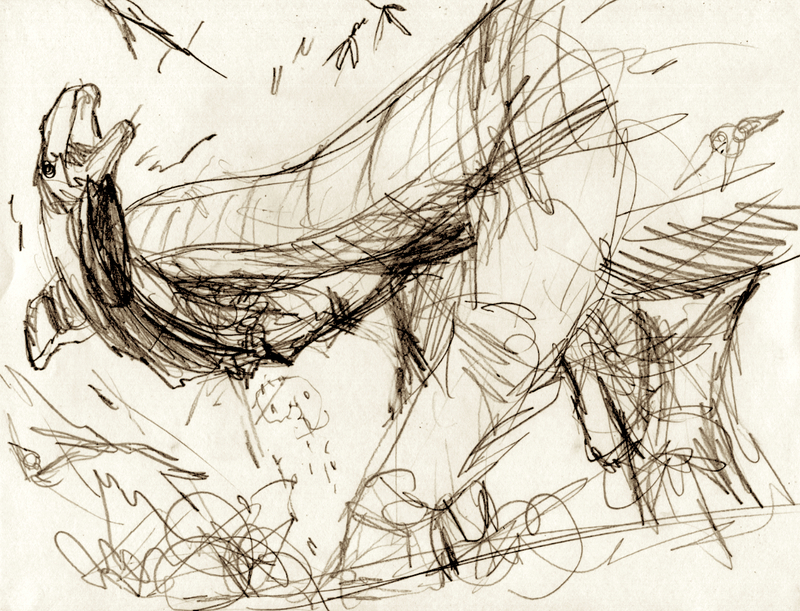 The real moral of this story is: if I had a crack at drawing fighting apatosaurs, you definitely can. Let us know if you do — leave a comment. We’ll gather people’s contributions in a future post. The process of reassembling my cat skull continues. I now have the sphenoid and both nasals now back in place, and the time has come for the now-traditional multiview. 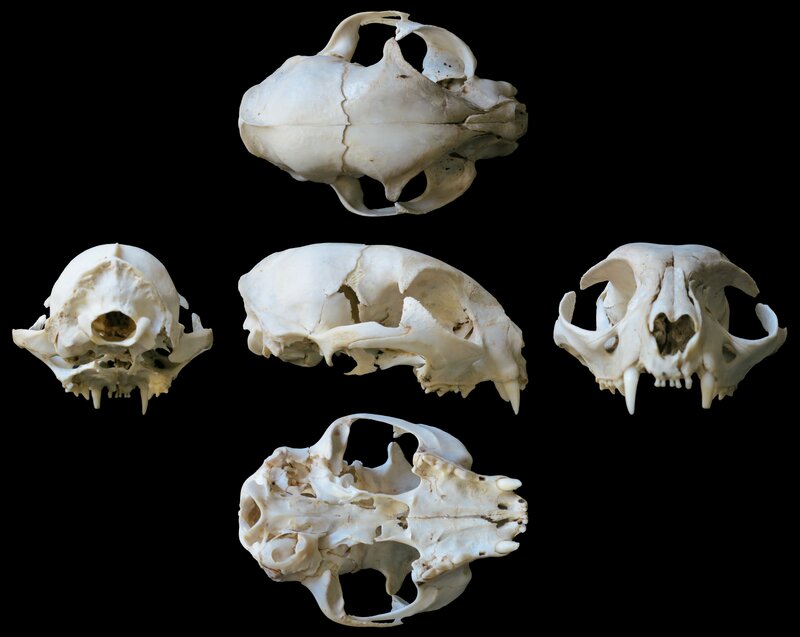 (Previous examples: pig skull, wallaby skull, sheep skull. Click through for seriously high resolution (9602 × 7642). 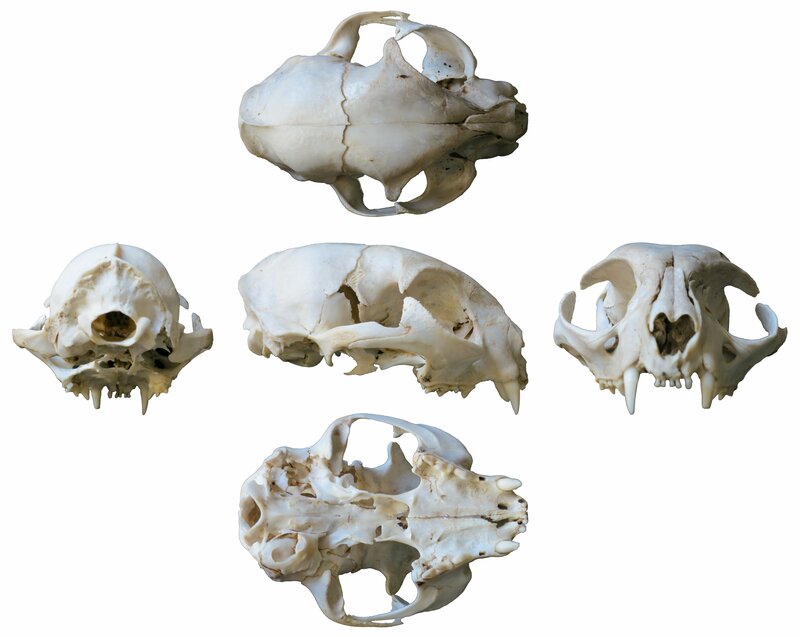 As though you need to be told: the top row shows the dorsal view, the middle row (from left to right) shows posterior, right lateral and anterior views, and the bottom row shows the ventral view. All the pictures in the previous post show various forms of ventral-to-ventral combat, but we’ve also been thinking about possibilities, and an important one is ventral-to-dorsal. But other extant animals have a much more violent combat style, based on striking blows rather than exerting steady force. Notably, giraffes do this, using their long necks as levers to crash their uncharismatic, highly fused mammalians heads into each other. 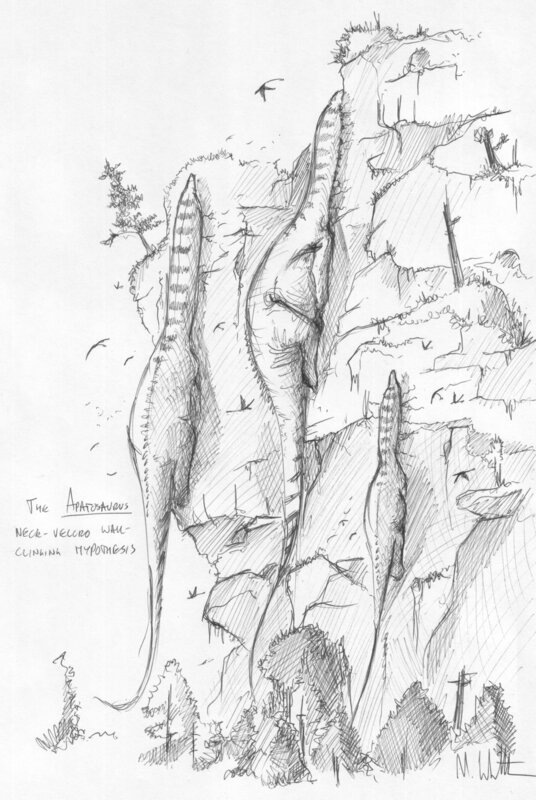 Could apatosaurs have done this? Not exactly: their heads were far too small to be effective clubs, and far too fragile to survive being used in this way. 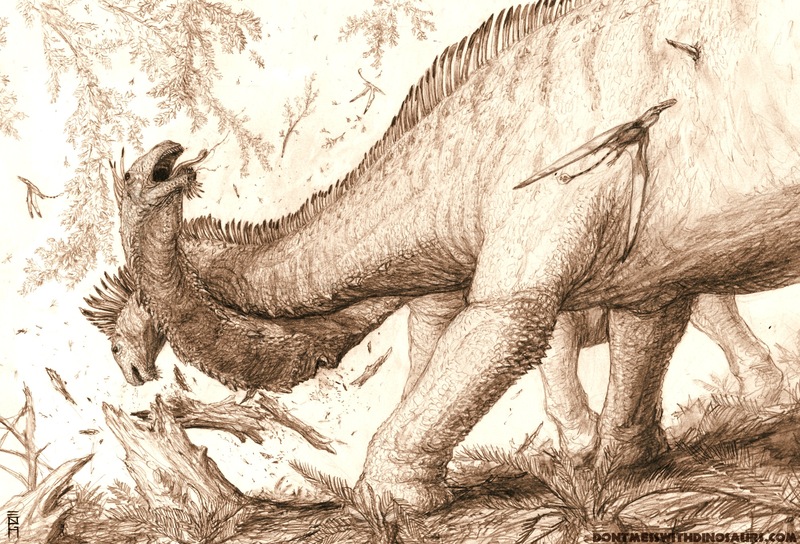 But the necks themselves would have been formidable weapons: we’re confident that apatosaurs striking blows would have done so with their necks, bringing them powerfully downwards on their adversaries. So what style of combat did apatosaurs use? Ventral-on-ventral shoving? Wrestling to the ground? Striking downwards blows with the neck? My best guess (and it’s only a guess, necessarily) is that among the half-dozen or so recognised species of apatosaurine, all these styles were likely in use. And this may explain the variation in cervical morphology that we see between species (though of course ontogeny and sexual dimorphism may also be at work). In short, I think all of these scenarios are credible — and therefore perfectly legitimate subjects for palaeo-art *hint hint*.